Not my work product, but absolutely worth sharing! 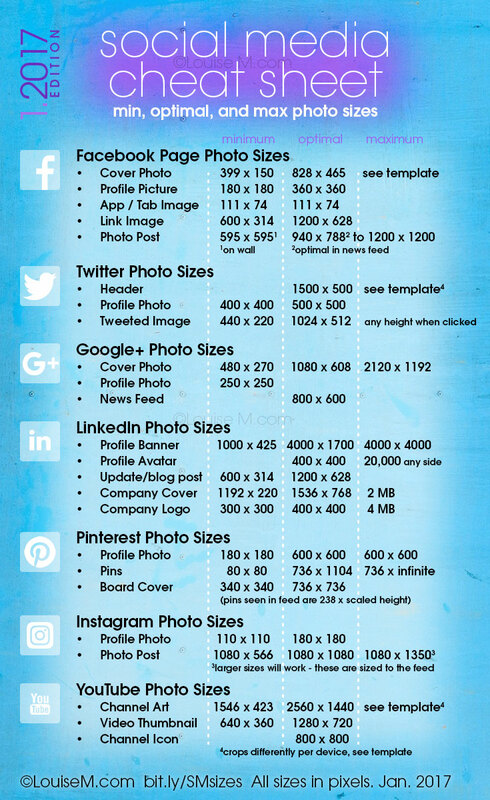 Louise Myers, over at Visual Social Media, has created a post, with the details about the image below, for the latest, greatest image sizes for all the big boys in social media: Facebook, Twitter, Linkedin, Google+, Pinterest, Instagram & YouTube. Facebook alone has more than half a dozen sizes (the most popular are on the cheat sheet below). I’m personally working on a template for a few, because they don’t always scale well to different devices and I’m tired of text and headlines getting cut off when viewing on mobile devices. Makes me a little crazy. Using video as part of your marketing plan is a smart move these days. Even smarter is getting the most out of your efforts by applying basic SEO to your YouTube videos. Like photos on your website, YouTube & Google have limited ability to understand what your video is about unless you tell them. You don’t want to be spammy about it, but you do want to be consistent. Follows is a simple infographic with the basics of YouTube SEO. Got your attention, didn't it? It's not really a secret, it's just that so many people simply skip it, or don't use it well, that you'd think it was a secret. Are you looking for a set-it-and-forget-it way to keep your company information in front of your contacts? One that's FREE? Piece of cake! Your email signature is the perfect opportunity to not only make sure your contacts have information about how to contact you, but it's a quick way to share links to your web site, your social networking pages, and even a YouTube video channel. Don't stop there, though... A one-liner about your business that get's people interested (referred to as your "talking logo" by John Jantsch in Duct Tape Marketing) should also be there. Every modern email program has some sort of a "signature" option available. Once you set it up, the signature is attached to every email you send out. Most programs even allow you to have multiple signatures. In the case of the Mail app on my Mac, I can have multiple signatures for each email account. Email signatures should be either text or html. There should be no graphic attachments in your signature — your logo can, and should, be embedded as HTML. To do this, the logo or other graphics must be hosted on the internet somewhere. The "somewhere" can either be on your own hosting account, Flickr, Picasso, Photobucket, etc. CONFIDENTIALITY NOTICE: This e-mail may contain confidential and/or privileged information and is intended to be read only by the person or authorized representative of the organization to whom it is addressed. Please do not print, copy, re-transmit, disseminate or otherwise use the information, all of which are prohibited. For your protection, we remind you that this is an unsecured email service, which is not intended for sending sensitive information. These particular signatures serve various purposes. I've just updated it and the CDG (html) version with my social networking information. The logos and graphics help maintain my brand for my various ventures. I've created a WordPress plugin exclusively for the use of my clients to create the html they need for their own email signatures. The book “Duct Tape Marketing” by John Jantsch is easily one of my favorite business marketing books. Jantsch takes tried-and-true marketing concepts and breaks them down into understandable, usable, basic methods – suitable for the average business person. Identify your ideal client (page 2). This is actually chapter 1 in the book, and for good reason, if you don’t know who you are marketing to, you will have no focus in your message. If your business is handyman services, your ideal client is probably a 40-ish woman who either doesn’t have a man around the house or has one that isn’t getting household projects done. How you relate to that market segment is completely different to say, how you relate to a single 20-ish woman. Develop a core marketing message (page 20). This isn’t the “mission statement” popularized in the 80s that became a self-aggrandizing joke. Jantsch focuses on setting one’s business apart from the competition. It’s more than just a slogan, too. For Hampton Roads locals, think in terms of WAVY-TV’s “10 on your side” brand. If they didn’t actually deliver on the message, it would be nothing more than a slogan, but the community at large knows WAVY’s history of getting involved. It’s what set’s them apart from the other stations in the area. Match your business identity to your message (page 39). Identity includes everything from your logo to your to your website to your outgoing voice mail message. All the components of your identity should clearly identify your company, it should appeal to your target market, and it should differentiate your firm, as well as support the most important aspect of your core message. Writing an effective ad (page 115). While this strategy was developed with focus on small display ads, the premise and techniques are perfect for Pay-Per-Click (PPC) ads, such as on Google or Facebook. He talks about writing headlines that get read and a powerful call to action. Become an expert (page 156). This is just part of the whole PR chapter, which is quite involved. I’ve seen the same concept in other books, and that is to become a source for reporters when they need to get an expert opinion on an element of a story. The PR chapter goes into detail on how to reach the right media outlets and even outlines the elements of a good press release. These are just some of the high notes from the book, which is chock full of practical techniques. Jantsch builds on the basics of good marketing practices in a way that the average Joe-business-owner can understand and immediately put to use. Here is an internet marketing secret most people ignore: get your business in Bing Places (Bing Local). While you might think nobody actually uses Bing, you would be wrong! Bing is the default search on every iOS device sold in America. If you talk to Siri, or use spotlight to search, you are using Bing, and that’s a significant amount of traffic. It would be foolish not to add your business to their local listings. It’s free. Free advertising is ALWAYS good. You have to have a Windows Live ID to create the listing, but that only takes a few minutes to set up, so don’t use it as an excuse. Make sure to take advantage of all the category and services fields, just like on Google Local, the more information you provide, the better your listing will work for you. For instance, instead of just saying “handyman”, spell out “tile repair, cabinets, faucet installation, etc.” Really use the space they provide to provide specific details in order to capture more of your potential audience. Bing verification is pretty much like Google’s, they’ll send you a postcard to validate your business. Take 10 minutes RIGHT NOW and add your listing. And if you don’t already have a Google local listing, add one of those immediately, too!